NOW Energy combines a comprehensive array of nutrients and dietary ingredients that provide your body with a natural source of energy. We use ingredients such as Guarana, Yerba Mate and Green Tea to provide a natural source of caffeine and support for the thermogenic processes in the body. Looking to have a steady flow of energy throught the day? 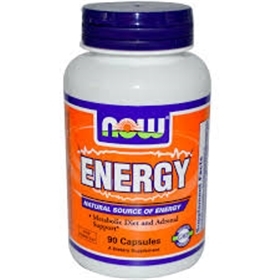 Taken regularly, you may experience a noticable improvement in energy levels all day long. Rhodiola can increase your stamina and endurance by increasing your red blood cell count. Red blood cells (RBC) carry oxygen to muscles, and having a higher count can dramatically improve an athlete’s performance and delay fatigue. Rhodiola works by boosting EPO also known as erythropoetin which stimulates RBC production. According to a study published in the International Journal of Sports Nutrition and Exercise Metabolism in 2004 rhodiola has anti-inflammatory benefits to cause rapid recovery of muscles and improved endurance. Rhodiola can calm your body when your system goes into a “fight or flight” mode from everyday stressors. One of the many incredible characteristics of rhodiola is that it helps your body burn stored fat as fuel. Rhodiola contains an active compound called rosavin that has been proven to trigger a fat burning response in your body. Rosavin works by stimulating an enzyme called hormone-sensitive lipase which has the ability to breakdown fat that is stored in adipose tissue (belly area). Also, human clinical studies found that if you combine taking rhodiola extract with doing moderate exercise the breakdown of belly fat increases even more. The ECGC contained in green tea extract limits the negative effects of a fatty diet as well as smoking. Consumption of green tea extract promotes the process of thermogenesis and increases the rate your fat metabolism, without increasing the heart rate- it will not make you jittery. Panax ginseng may enhance male fertility by increasing sperm count, quality, and movement, as it activates the body system that increases production of certain hormones. To increase athletic performance, panax ginseng can be taken as a sports supplements. It has been shown in research to improve energy and endurance. For women, panax ginseng can cause an effect similar to that of estrogen, by stimulating hormone production and related chemicals. NOW Foods was founded in 1968 under the belief that good health was not a luxury available only to the wealthy. For the past forty-five years, they have made it their life's work to offer health food and nutritional supplements of the highest quality, at prices that are fair and affordable to all those who seek them. Today, NOW Foods is one of the top-selling brands in health foods stores, an award-winning manufacturer, a respected advocate of the natural product industry, and a leader in the fields of nutritional science and methods development. And while they have grown considerably over the past four decades, one thing has never changed – their commitment to providing products and services that empower people to lead healthier lives. Suggested Usage: As a dietary supplement, take 2 capsules twice daily with 8-12 oz. of water, preferably with or before meals as needed. Other Ingredients: Gelatin (capsule) and Magnesium Stearate (vegetable source). Contains soy derivative. I have been taking this on and off for years- I checked with my very brilliant and ethical naturopathic doctor before and only took it with his approval. It definitely boosts my energy level- with no crash, and as a bonus seems to help me keep off any excess weight- a bonus as I am now 48 and like to be very athletic.